Lately I’ve been spending time troubleshooting the Sparks family WiFi. Specifically, I’ve been trying to tweak the placement of our various Wi-Fi paraphernalia so as to get a better signal in my daughter’s room in a far corner of the house. I needed a good diagnostic tool to give me an idea of how the Wi-Fi signal strength was doing in various points of my house. The first thing I tried was the expanded WiFi data built into OS X. You can get this by Option-Clicking on the Airport icon in the menu bar. It gives a lot more data about your active WiFi signal than the standard click. That wasn’t good enough for me though. I wanted more details about speed and I wanted to see how the channels were lining up with my neighbors. If you and your neighbors are all fighting over the same sliver of bandwidth, trouble ensues no matter what you do. All of this led me to the Mac App store, where I purchased a $3 app, WiFi Explorer. 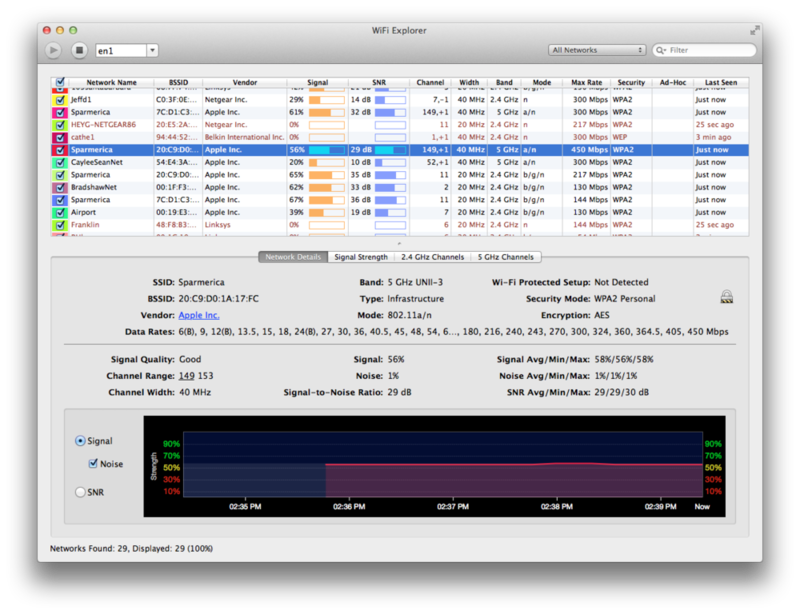 WiFi Explorer provides the mother lode of WiFi data. The app sports a top pane that lists every available wireless network. The second pane presents a graphical representation of the selected networks. There are four potential displays: Network Details, Signal Strength, 2.4 Ghz Channels, and 5Ghz Channels. You can also filter the list between open, secure, ad hoc, and preferred networks. The below screenshots demonstrate the interface. I’m getting tons of information with this app on my network and my neighbors' networks. Using this I’m able to optimize my network with both placement of my mobile base stations and channel selection to avoid crashing in to other networks in the area. If you are going to be studying this data over time, you can export your WiFi Explorer data to a .csv file and open it in Numbers or Excel. Because I’m a nerd, I’ve done this and plan to keep a running history of what works (and doesn’t work) with the home WiFi. Also, if things ever slow down again, I can go back and study prior data to determine what went wrong.